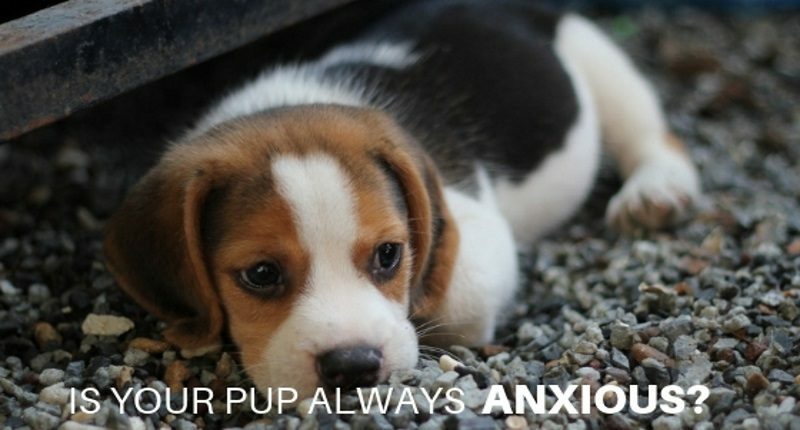 Does your little precious pup react nervously to certain events? Remember, just like humans, dogs can be nervous about different things. I’ve seen dogs moan when they get into cars and I’ve seen dogs incessantly bark when their owners leave for work. We’re all familiar with the dog that has trouble falling asleep without its owner by its side. It might be cute at first to see your little puppy whine and show their sad face with their droopy eyes, but of course, anyone will start to feel a bad when this continues every day. So, if you’re starting to wonder how you can help your friend, this article was written for you. First things first, if you’re worried that you did something wrong, you should definitely not blame yourself. Some dogs are just more anxious than others. In fact, it’s so common that there are tons of products on the market that can help. All these products are meant to be calming supplements for dogs, so they will not carry the negative side effects that many medications do. Are you overwhelmed? Don’t worry; this guide can help you sort out the good and the bad. Once you finish, you’ll have the perfect knowledge of anxiety and calming supplements for your dog. I decided to consider the following factors as I chose these 6 products. One popular brand of dog treats is SmartBones. These treats work great as a calming supplement for dogs. 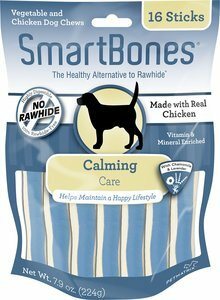 I recommend buying the Calming Care Chicken Chews Dog Treats. There are 16 treats in a pack. Each treat is made out of grain, but also has a few vegetables and chicken mixed into it. This calming treat also has chamomile and lavender extracts because these natural ingredients have a mild sedative effects. This treat is also extremely healthy because it has many essential minerals and vitamins. There isn’t much fat in it either, and it’s great for digestibility. Dentists are fans of this treat, too! Smartbones will help keep your pet’s teeth white and healthy. You only need to give one to your dog and he or she will quickly lose its sulking face. Your pet will love the taste of chicken and be able to relax at the same time. 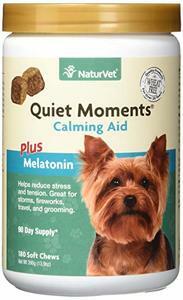 Another calming supplement for your dog is NaturVet Quiet Moments Calming Aid Dog Soft Chews. This supplement doesn’t rely on natural calming effects; instead looks to provide your little friend with a few necessary vitamins and minerals. It has thiamine and L-Tryptophan which help get rid of stress and tension. It also has melatonin in it, which will help your dog sleep. All of these are extremely safe ingredients, but if you do see any problems you should immediately contact your vet. This anti-anxiety supplement also has ginger, which can help calm your dog’s tummy. I think the background in creating NaturVet really shows how well this calming dog treat will work. The owner of this brand had adopted a dog that had arthritis. He decided to work as hard as he could to develop a treat to help his dog relax. That said, NaturVet is born out of love and care. This calming pill comes in a 70 count or a 180 count. 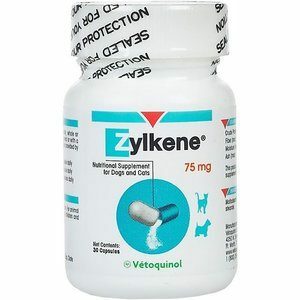 Vetoquinol Zylkene Behavior Support Capsules are some of the best calming supplements for dogs. These capsules are not tranquilizers and do not make your dog sleepy at all! They use alpha-casozepine, which is a natural mineral found in cow’s milk. If you’re confused as to why this will help your dog, just imagine a little baby. Babies like to drink milk because this mineral helps soothe and calm them. And, this works the exact same way for a dog. With this newfound sense of safety, your dog will now be able to feel comfortable whenever you need to move or travel. 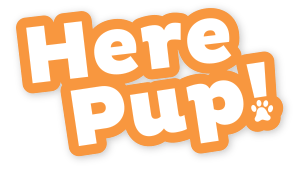 It helps your dog adapt and become familiar with its new surroundings. These treats can easily be mixed inside your dog’s food for easy ingestion! It’s safe and perfect because it doesn’t have the same drowsy side effects that many people don’t like to see in their pets. You can cut back on strong medications, like Zylkene, and avoid medication’s nasty negative consequences. They might take a bit more time before you see its effects, but they do work. I guarantee you’ll appreciate how safe they are. 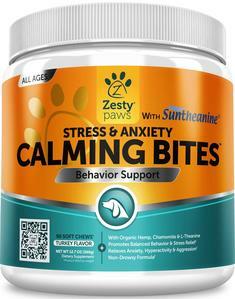 Another important calming supplement for dogs is Zesty Paws’ Calming Bites. 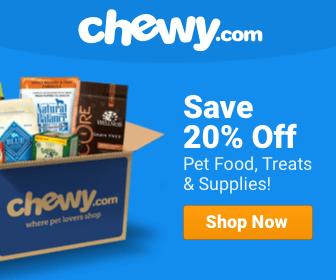 They come in many different flavors and are perfect for dogs that are picky with their food because you can buy one that aligns with your pet’s prestigious taste. These bites use Suntheanine, which is an amino acid that helps animals calm down and relax. Many people buy these supplements for high energy pets. These calming pills for dogs also combine a mix of healthy nutrients and plants that all help reduce anxiety for your beloved pet. Plus, since they are so tasty, you can feed them to your dog like treats, or just before they are about to enter into a stressful situation. For many dogs, these supplements will act fast, and you will see the effects right away. Your dog will relax and seem far more calm than before. 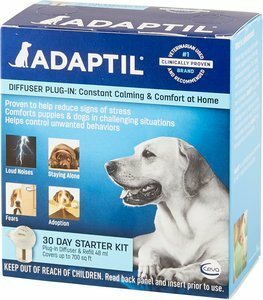 If you are looking for a calming supplement that is a little more permanent, you can take a look at the Adaptil Electric Dog Diffuser. This diffuser is meant to be plugged in a room; it will diffuse a synthetic copy of an appeasing pheromone that lets your dog understand it is safe and that it can relax. This pheromone is the same one that a mother releases when she first has her newborn puppies. And, what is more relaxing than the idea of being next to your mother? The amazing thing about the Adaptil’s diffuser is that it’s easy to use. Just plug it into the room that your adorable friend stays in most. In some rare cases, your dog may seem to act the same as before. Some dogs are affected very quickly, while others may seem not to change at all. The good thing is that this diffuser is loved by many vets. If you’re worried that your dog is not getting better, just tell your vet that you have started using Adaptil’s diffuser and they can tell you why you might need to wait a little longer. I recommend starting with Adaptil Electric Dog Diffuser’s starter kit. This kit will give you enough diffuser for a month. You can buy a refill for an extremely efficient cost too. There is, however, one warning that you should be aware. Eating the diffuser can be very dangerous. So if you have a small child, you may want to find a plug that is hard for the child to reach or prevent the child from being able to enter the room where you have plugged the diffuser in. You can always choose to make your dog calm by looking chic! There are calming clothes for dogs everywhere. A lot of them are referred to as anxiety vests because they look snug when you put it on your best friend. I’ve tried a few vests, but personally, I love the vests made by the brand Thundershirt. Well, actually, let me correct that. My dog loves the vests made by Thundershirt. Thundershirts come in all different sizes and different colors. They also have different designs. So, you can buy the classic design, the polo design, or the sports design. I think all three designs are way ahead of the other vests that exist. Besides searching for the best anti-anxiety vests for dogs, Thundershirt has also decided to compete and beat everyone on the fashion runway. My favorite design is the polo design because it looks like one slick sports legging on your dog. 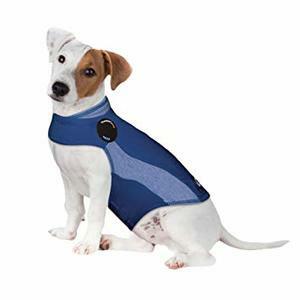 Most people will assume your dog is getting their exercise done if they see it walking outside wearing a Thundershirt. And, it probably helped me look a bit more sporty too when I took my dog out for our morning jog. Thundershirts are designed to give relief your dog of stress by acting as a constant hug. They fit extremely well, and your dog will think it’s being cuddled constantly. Just the idea of that is so cute! It’s super easy to take off and put on, too. Some people might struggle to figure it out at first. But, it won’t take you long to get the hang of it and it will become muscle memory. Of course, importantly, this vest can be washed anytime. Just throw it into the laundry machine with your other clothes to keep it looking and smelling its best. Like humans, trial and error is sometimes needed in order to find the best anti-anxiety supplement for your dog. The great thing is that there are so many options you can choose from. If you believe you can find the right supplement, the right supplement will come to your dog. Keep track of your results and that should help you see the difference between the purchases you make. Taking care of an anxious dog can be frustrating at times, but that’s just because they are alive. It’s one of the reasons why we fall in love with them in the first place. Thanks for sharing, some great tips here on supplements for our dog. Jake our dog is a Golden Retriever. I love that you are talking about different products to give them to assist with calmness. I was thinking of using Cedar Bear’s supplements to assist with this, but wanted to hear a professional’s opinion. Wow, it’s amazing to know that there are pet mineral supplements that can serve as calming supplements as well. I think I will consider the health benefits it has so that I can be sure that it will really help him a lot. Since there’s no harm in trying trial and error methods to find the best supplement, I’ll do my best to find one online that’s good for him.